When you meet a professional hunter for the first time (especially one that has his own TV show), you have expectations and questions. Are they going to be like their show portrays them to be? Will they be arrogant or humble? Will they be rude or friendly? Will they live up to the hype of their TV image? All of those questions were answered when Brian “Pigman” Quaca came to the City of Central, Louisiana, to hunt with my dad and me a few weeks ago. My parents, David and Lydia, are the owners of Reynerson’s Gunsmith Service, which is one of the largest of its kind in the nation, and we have been a part of the Central community for almost 20 years. David has also been the general manager for Bowie Outfitters in Baton Rouge for the past 10 years. The first time I actually met Brian “Pigman” Quaca was at the SHOT Show earlier this year. The SHOT (Shooting, Hunting, & Outdoor Trade) Show is a trade show for outdoor retailers from all over the country to see the newest and hottest product that will hit the market within the next year. There is also a banquet where the “state-of-the-industry” is addressed and awards are given out to some of the top advocates for the shooting industry. Brian has won the award for “Host of the Year” the last three years for his show, Pigman: The Series on the Sportsman Channel. We ran into Brian one night at the SHOT Show in January, and what was initially surprising to me is that when we asked him to dinner, he graciously accepted. After I got to know him a bit, I realized that I should not have been surprised. He is a Texas boy from Groesbeck, just south of Dallas, and he is as engaging off-screen as he is on. I asked him if he goes by Brian or Pigman, and he replied with a Texas drawl, “Well, my friends call me Pigman or just Pig.” After a couple hours of hilarious hunting stories and a delicious meal, we invited him to come hunt with us if he was ever in Louisiana, but never really expecting to hear back from him. But mid-July, we got a call from his business manager saying that Pigman wanted to film an episode of his TV show with us on the Beechgrove Plantation, just north of Clinton, LA. After a few phone calls to set up the hunt, we decided to do an intense three-day hunt. It would require some late nights, but that could pay off in a big way if everything worked out. DAY 1 – Pigman and his cameraman drove eight hours from Dallas to Baton Rouge. Then we took them another three hours south of Baton Rouge for our first hunt – Bowfishing for redfish in the marsh with airboat captain and taxidermist Freddie Smith. He owns Wildlife Reflections Taxidermy and guides for Addicted2bowfishin Adventures. You may be asking yourself, “Why are they taking the Pigman to shoot fish, I thought he hunted hogs?” Well, we wanted to take him to do something that was uniquely Louisianian. As it turned out, bow hunting for fish out of a large airboat in the middle of the marsh was just what we needed to kick off an amazing three days of hunting! The airboat was the largest I had ever seen, and it had multiple lights surrounding the exterior of the hull so that we could see the fish below the surface of the murky water. It might have looked a bit strange to see a brightly lit airboat flying 30-40 mph through the South Louisiana marsh, but we were out in the middle of nowhere and it was after midnight. While everyone else slept, we were geared up and ready to shank some fish. Little did I know, I was about to find out how good a marksman the Pigman really was! On TV, unlike real life, they can manipulate the footage and make the shooter look better than he really is, but they won’t have to do that for this episode of the Pigman show! Let’s just say that any doubt that I had about the Pigman’s being the real deal were quelled after seeing him shoot with accuracy and precision as he limited out on redfish before I had even shot my first fish! The Pigman hit his first five fish without a miss! Those of you who bow hunt know how hard it is to shoot a moving target with an arrow, but bowfishing is a bit deceptive if you have never done it before. Not only are you hitting a fish swimming under the water, but also you have to aim about 6” below it to compensate for the refracted light that you see on the surface. I can’t reveal all of the details of our fishing expedition, but let’s just say that it was a great success and you will enjoy it when you watch our adventure on Pigman: The Series! DAY 2 – After bowfishing until 4 a.m., we had to sleep a couple hours before we drove to the Beechgrove Plantation, just north of Clinton. John Barton Jr., the owner, was kind enough to let Jim LaCour from the Louisiana Department of Wildlife and Fisheries take us on a hog hunt. Over the past few years, the hogs have been tearing up the farmland and cow pastures. 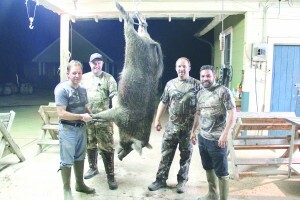 LDWF has been given permission to harvest hogs for research to benefit the LSU Ag program. Even though research is the goal, the eradication of these hogs helps farming as well as deer management on the 8,000+ acre plantation. Always resourceful, the LDWF has developed a system to combat the South Louisiana heat — hunt at night! They are set up with thermal night vision goggles and suppressed .308 rifles with night vision capability. After just a few hours we had downed a few hogs, collected blood samples and gotten enough footage to educate the average viewer about the hog epidemic sweeping the nation. If you haven’t hunted hogs at night, it should definitely be on your bucket list! Stop by Reynerson’s Gunsmith Service and see the .300 Blackout rifle with night vision capabilities that we built for the Pigman. We may even be able to build you one! DAY 3 – One of the guys who was helping us with the hunt was David Moreland, a wildlife biologist. He had pictures of a large hog coming to the same spot for the past couple nights. This could be the trophy hog that would make it on the TV show. We had one night left, and no room for error. The hog had been caught on camera between 10 and 11 p.m. the past couple nights, and there was no reason to think that tonight would be any different, but as a precaution, Pigman wanted a small team to make as little noise as possible. So, he and his cameraman crept to the blind about dark and began to wait for their chance at a shot. Many of you know what it is like to sit on a deer stand in the winter, and the boredom that can set in while waiting sometimes hours to get your shot. Now imagine it is the middle of the night. No moon. Pitch black. You have to use your sense of hearing to determine if that is a 300-pound wild boar less than 10 yards from you or just an armadillo? It is 90-100 degrees in the blind, which blocks you from any breeze that could possibly waft through the large live oak trees. The humidity is suffocating, and the sweat pours off of you as you wait. 10 p.m. You get restless. During the day, you can read a book while waiting or you can play a game on your phone, but now you don’t dare turn on your phone and risk being seen in the dark night. 11 p.m. Is the hog going to come tonight or did we just strike out? At 1 a.m., we were back at the camp with a trophy boar. Three days of successful hunting, and we had enough footage for Episode 1 of Season 5 of Pigman: The Series! Look for it to premiere in January 2014, probably around the time we will be at the SHOT Show prepping for the 2014 fall hunting season. Pigman will be there — probably winning the Sportsman Channel award for “TV Host of the Year” for the fourth time in a row! Until then, I will tell you what he told me…“Keep Shankin”! Editor’s Note: Nathan Reynerson is owner of RGS Imports, located in Reynerson’s Gunsmith Service on Hooper Road. RGS is the importer and distributor in the US for Arno Bernard, a custom knife maker from South Africa, and other imported hunting accessories from South Africa. The 2012 episode “Pig & Ted’s Excellent Adventure: Aporkalypse Now” of Pigman and Ted Nugent hunting hogs out of a helicopter is one of the most controversial as well as the highest rated hunting shows ever produced. On August 25, 2013, the second installment, “Aporkalypse: Silence of the Hams”, aired on the Sportsman Channel and reportedly, Pigman and Nugent killed 400+ hogs in that one episode.